Left: An India dhow plies the Silk Route of the Sea as it did in antiquity. Anyone fascinated by the Silk Road exhibit at Fernbank might also have enjoyed delving into the study of "Global India and the Indian Ocean in Antiquity," a lecture presented on October 22, 2013 at the Michael C. Carlos Museum of Emory University by Jonathan Walz, Assistant Professor of Anthropology and Archaeology at Rollins College in Florida. In the lovely atmosphere of the museum, food and music softened the audience. A recital of several ragas and dhuns was given by two graduate students in chemistry at the University of Georgia: Anandi Roy on sarod, with Manish Hudlikar accompanying on tabla. 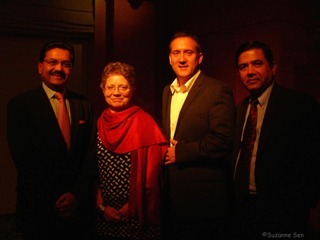 Then, with the lecture co-sponsored by US India Business & Research Center and by Emory's South Asia Seminar Series, Ani Agnihotri of USIBRC and Joyce Flueckiger , Professor of Religion at Emory, did the honors. The delightful surprise was the introduction to the topic by Consul General Ajit Kumar, who holds a masters degree in history from St. Stephens College at Delhi University and obviously still loves the subject. He spoke of Ashoka's activity in foreign policy in the 3rd century BC and of the Kushan empire in present-day Afghanistan, Pakistan, and western India. Of the Silk Road taking Buddhism to China, he quoted Hu Shih, former Ambassador of China to USA: "India conquered and dominated China culturally for 20 centuries without ever having to send a single soldier across her border." He noted the remnants of Indian activity in Southeast Asia, the most remarkable being Angkor Wat in Cambodia. Finally, we have the New Silk Road initiative meant to trade camels and caravans for rail networks and oil pipelines in Afghanistan. 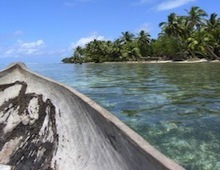 A pirogue plies the waters of the Indian Ocean. Dr. Walz introduced his topic: "Globalism arose in antiquity. Ancient India was a major hub of connectivity that entangled people, ideas, and goods along the Silk Route, from the heart of China in the east to the Roman Empire in the west. The Silk Route of the Land interconnected major cities of Han China, Kushan India, Parthian Iran, and Imperial Rome during the early centuries AD. And the Silk Route of the Sea drew together the great ports of the Indian Ocean, extending from the Red Sea to the South China Sea, including entrepôts on India's coasts that played crucial roles in global exchange. In this paper, I address the growth of regularized, trans-regional interactions and the emergence of cosmopolitanism in South Asia and the ancient Indian Ocean. History and the residues of antiquity contribute to a renewed understanding of the sustained flows of people and goods. The outcomes of these dynamic and sustained human relations in the first to third centuries AD and beyond continue to shape India's cosmopolitanism in the geopolitical present, as India re-emerges." Consider archaeology and trade: "This is a story that begins well outside the concept of states," he said. Multiple languages and faiths were found in ancient cities. Roman amphora shards were found in India. Indians of Greek descent live in northwest India. Cotton and asbestos from India were used in Roman burial shrouds. In the other direction, Southeast Asia had trade with India, proven by geochemical tests on beads found there. In modern days, research continues, sometimes running into conflicts with "progress," e.g. the road from Myanmar to Thailand which is interfering with archaeological sites. One place to discuss and prevent problems such as this is Heritage without Frontiers, an open internet resource which brings together the finest ideas, scholarship, and happenings in the areas of cultural and natural heritage, and is a project being worked on by Dr. Walz, Sunil Gupta – Assistant Director at the Allahabad Museum, and others. Further research: Conference: Proto-globalisation in the Indian Ocean world November 7th to 10th, 2013, hosted by the University of Oxford and the Sealinks Project. One hundred scholars and students from around the world gather for 3 days of presentations and discussions covering the latest multidisciplinary research on the early Indian Ocean.